New Zealand mills producing non-pruned lumber continue to work through a subdued domestic market with sales down on last year for Quarter 1. It is difficult to read the current market as some buyers may be increasing purchases before the lumber price rises in May. 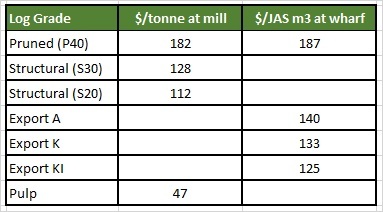 The sawmills supplying pruned timber have no such issue and are turning away forward export orders in some board widths, as they don’t have the capacity to supply. Sales in the China log market are stable with daily port log off-take averaging 65-70,000 m3 which is relatively high for this time of year. Total softwood log inventory remains high at 4.3-4.7M m3. If you include the volume that is sitting in containers, then the total inventory is 5.1M m3. At Wharf Gate (AWG) prices received for export logs in April decreased by $2-$4/m3 depending upon the grade and length. This decrease is due to increased ocean freight costs. It appears these recent cost increases have flattened, but freight tonnage looks very tight again at the end of April and may see further increases in shipping costs. 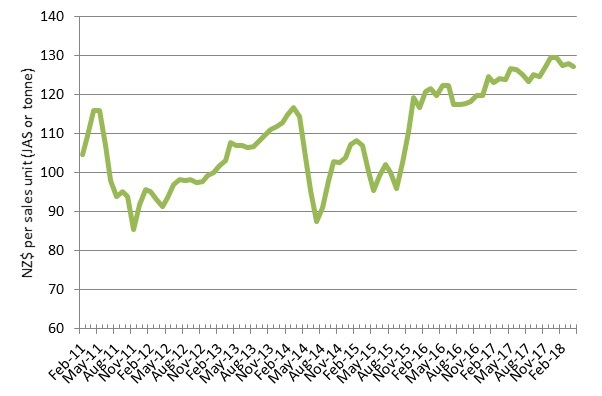 Due to the reduction in AWG prices for the export logs, the PF Olsen Log Price Index decreased by $1 to $127. (See PF Olsen Log Price Index below). The average sale price is currently $8 above the three-year average. The domestic demand for pruned lumber remains steady. Exports sales are still strong, and European demand has increased as major mill upgrades that commenced around October last year have been completed. Some mills report they are unable to take forward orders in some board widths, as they don’t have the capacity to fufil those orders. Sawmills producing unpruned lumber continue to report that sales of construction lumber are well below expectation. Increases in lumber prices are negotiated well in advance and the next price increase takes effect in May. Some buyers may be purchasing extra volume ahead of the price rise. Alternatively, there is usually a rush to finish jobs before winter kicks in. The export markets remain strong, so volume is still redirected to first Australia then further afield. Some mills have also reduced capacity. Many mills hope a softening of export log prices may reduce one of their biggest costs - purchasing logs. Total softwood log inventory remains stubbornly high at 4.3-4.7M m3. If you include the volume that is sitting in containers, then the total inventory is 5.1M m3. Sales in the China log market are stable with daily port log off-take averaging 65-70,000 m3 which is relatively high for this time of year. 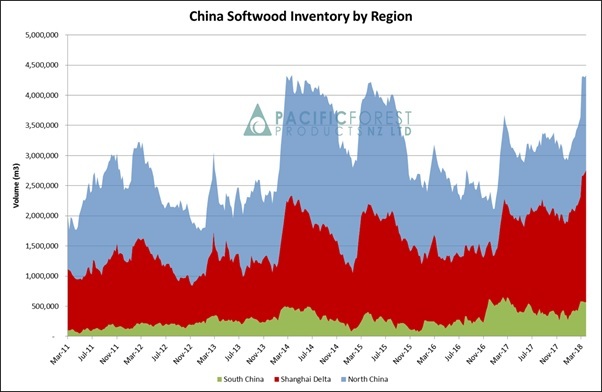 The softwood inventory by region is graphed below. Log buyers are becoming more discerning, especially in north China, and there is an increasing price gap between the longer 5.8m logs and the shorter 3.8m logs. Log quality is also increasing in importance as the market adopts a softer tone on the back of the high level of log inventory. 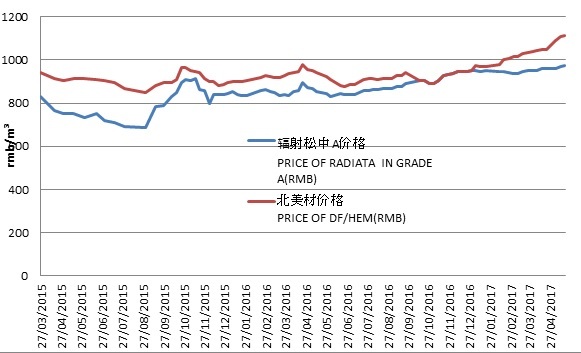 The graphs below show the average price of logs in China for both ‘A-grade’ radiata and Douglas fir/Hemlock. The prices are recorded in renminbi (RMB) which is the term for the Chinese Yuan (CNY). 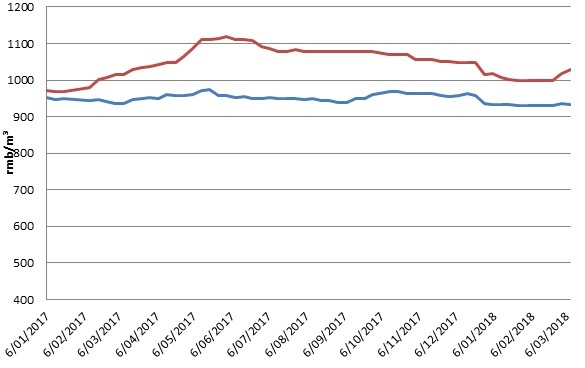 As you can see the log price was relatively stable last year after increases over latter 2015 and 2016. Graphs courtesy of China Forestry Group NZ Ltd.
Two recent initiatives in China should increase the use of NZ pine in the future. First the Shanghai municipal government has started compiling a guidebook on passive house constructions, a move it hopes will encourage a more energy-saving and environmentally friendly construction model. More information can be found here in CanadaWood. Second China will set up a new ministry to protect and manage the country’s natural resources, according to a reform plan submitted to the national legislature in the middle of March. The new ministry will oversee the development and protection of the country’s natural resources, including native forests formerly harvested. Suppliers of logs to India, who instead supplied China over February/March, have recommenced supply into India. Suppliers are monitoring and not oversupplying the market. Demand is still slightly subdued with monthly consumption at 120-130,000 m3 . Previous consumption has averaged about 150,000 m3 per month. Construction is still down and we are seeing some liquidity problems in the packaging market which means sales from the mills are reduced. Some lumber buyers are still struggling with entering GST returns on time which causes issues through the supply chain. As mentioned in last month's Wood Matters the Handysize freight rates have rapidly increased since the Chinese New Year. Oil prices also spiked in March. Recent prices indicate this rise has slowed or even stabilised, but the Handysize/logger freight index remains strong, while the overall Baltic Dry Index is trending down. Some predict freight tonnage to be very tight again at the end of April and we may see more increases in shipping costs. Export prices offered for NZ logs in May will depend upon the outcome of the negotiations between the various log exporters and ship owners. The relationship between the NZD and the USD is being driven by the strength of the USD. The AUD has weakened on the back of poor iron ore numbers, so that may keep us pegged down. The AUD relative to the USD is back to pre-Christmas levels whilst the NZD is still 3 cents off that. The US is currently in a strong growth phase and has an unemployment level at 4.1% compared to our 4.5%, along with an increase in their Official Cash Rate (with two more planned for 2018) compared to our status quo. Yet the NZD remains stubbornly high. The current tariff/trade war between China and the US is also likely to have a significant effect as currency markets traditionally react negatively to any form of trade intervention and previous protectionist efforts by the U.S. government has resulted in dollar weakness. Tariffs introduced by Bill Clinton in 1995 and George W Bush in 2002 resulted in 15% declines to the USD. The biggest issue is the risk of a possible flight of capital flows needed to finance ballooning U.S. deficits. Due to the decrease in price for export logs, the PF Olsen Log Price Index decreased by $1 to $127 in April. The index is currently $3 higher than the two-year average, $8 above the three-year average, and $14 higher than the five-year average. Note: Actual prices will vary according to regional supply/demand balances, varying cost structures and grade variation. These prices should be used as a guide only and specific advice sought for individual forests.